Teaching students the importance of helping their community begins in the Lower School. We want our students to understand that even at the youngest age, they can make a difference. No matter what level of involvement students choose, we want all students to realize that Buckley is dedicated to reaching out, whether it’s helping others at school, in the wider Los Angeles community, or beyond. Students in sixth through eighth grade can participate in a wide variety of community service activities. 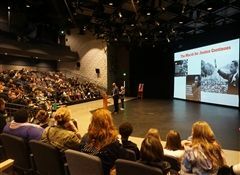 Through both grade-level projects and school-wide events, students become involved in activities that improve the world around them. Sixth/Seventh Grade: Students are invited to begin exploring different service activities within small groups. Groups of two to four students visit a nonprofit agency of their choosing and perform five or more hours of service. Each student is required to submit an individual reflection paper about his or her experiences. 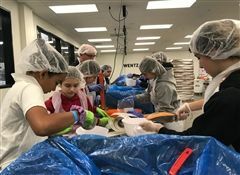 Eighth Grade: Students participate in a week of service-learning activities. As part of the program, for example, they may visit a homeless shelter to help prepare and serve meals and meet the residents. Students are encouraged to participate in the Community Service Honors Program, where they can earn honors designation for completing 25 hours of service or, for 50 hours of service, a Presidential Service Award. It’s a committed group — last year more than 50 students received Community Service Honors and 14 received Presidential Service Awards. Members of the Buckley community have long been dedicated to service. Thanks to their commitment and involvement, the school has been able to make its community service program more meaningful and impactful with each passing year. Graduation Requirement: Upper School community service is a Buckley graduation requirement. Service Projects: Presidential Service Awards excluded, the school does not track the hours of service a student completes. We have found that in tracking hours completed, it is easy for people to lose sight of the experience of serving and the foundational lessons learned from that experience. That’s why Buckley Upper School students complete a project of their choice each year. This project-based approach helps students identify a cause they are passionate about and focus on the impact they are making, rather than on logging required hours. A dedicated group of Upper School service leaders, the Community Service Council (CSC), are available to help students choose and plan their annual service project. CSC members present community service project options at an assembly in early October. Students can also develop independent service projects. These projects often grow out of community involvement near home, with an organization the family supports, or one in which the student has a special interest. The Buckley School’s extensive program of community service engages students in local and global communities through their support of causes, agencies, and individuals in need. Activities as varied as natural habitat restoration, food drives, fundraising for disaster relief, math mentoring, and shelter animal care, enable students to enrich the world around them. Students see, firsthand, how the power of their actions can make a positive difference in communities near and far and in their own lives. Community Service brings critical elements of Buckley's mission to life and actively supports the development of well-rounded individuals through ethical education. This week, eighth grade students visited two amazing local organizations, Children’s Hunger Fund and the Hope of the Valley Rescue Mission, on their service trips. 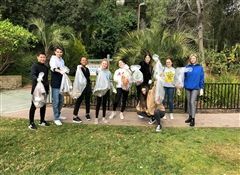 On Monday, January 28, 2019, all Upper School classes were suspended as students engaged in a day of service.